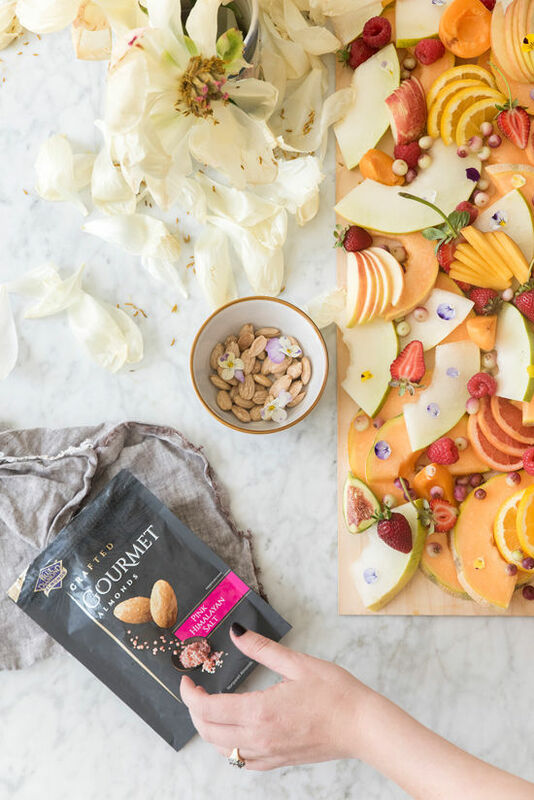 back with our second post with Blue Diamond and their new Crafted Gourmet Almonds! this time, it’s all about entertaining at home, which is something i really enjoy. 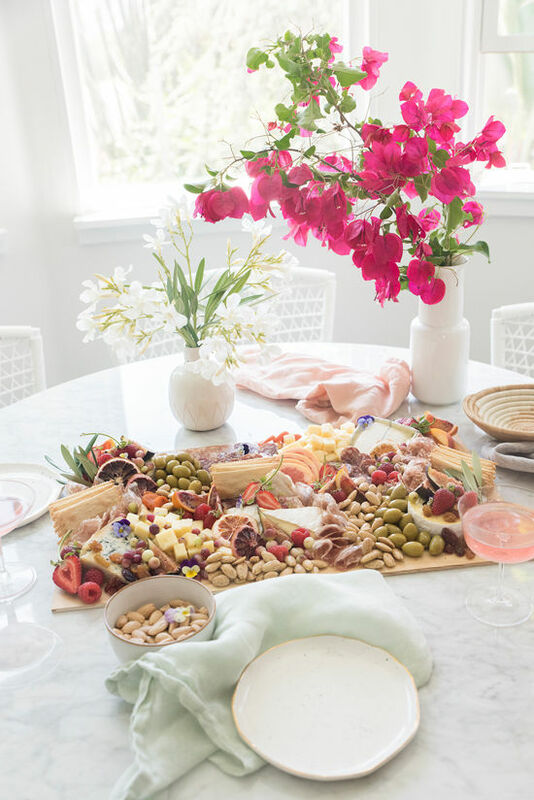 whether it be hosting a sunday dinner at my house, an impromptu gathering on my patio or girl’s night to catch up on reality tv, i love having people over to share food and hang out in my kitchen. once justin moved in, entertaining became way more fun because we shop and prep all the food together and i find it to be a really relaxing way to spend the weekend. 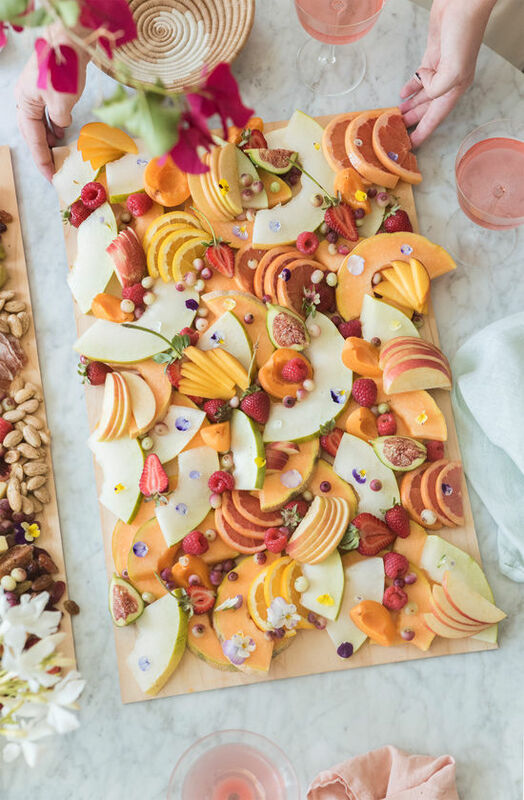 it’s always more fun to create something beautiful and delicious when you have people to enjoy it with! 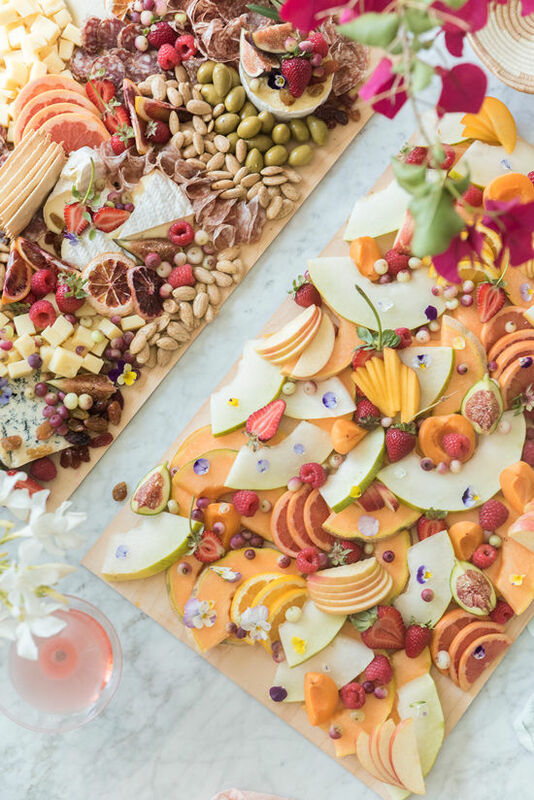 • pick cheeses based on how they work together in flavor on the board. we usually go by what is soft/medium/hard to mild/unique/familiar. 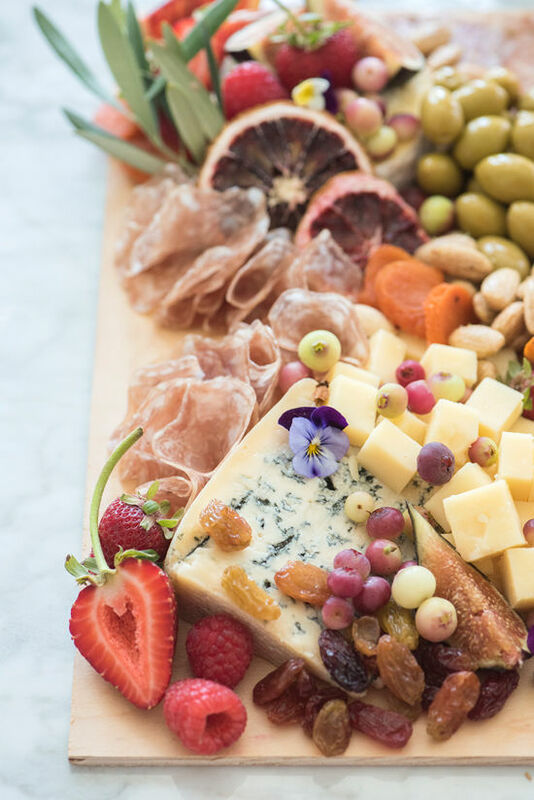 We always recommend splurging on at least one cheese as you truly see the difference in quality and taste! 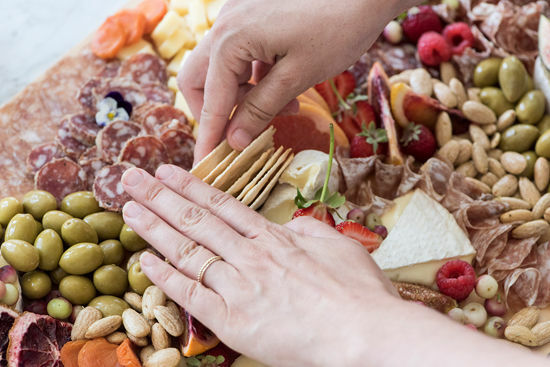 • we recommend going to your local farmers market (if possible) for seasonal produce to pair with your cheeses and almonds. 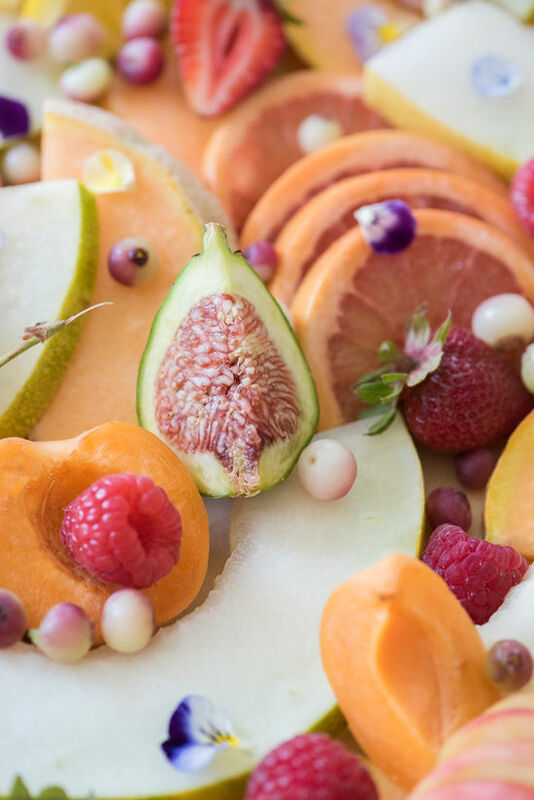 Right now we are in summer so the markets are bursting with stone-fruit, grapes, melons, figs, and summer berries. A cheese lovers dream team! the farmers markets make you think out of the box, and guide you try something new and different. there is truly nothing like getting your produce straight from a farm. the taste is unlike anything you’ll find in a market. and will bring your boards to the next level! 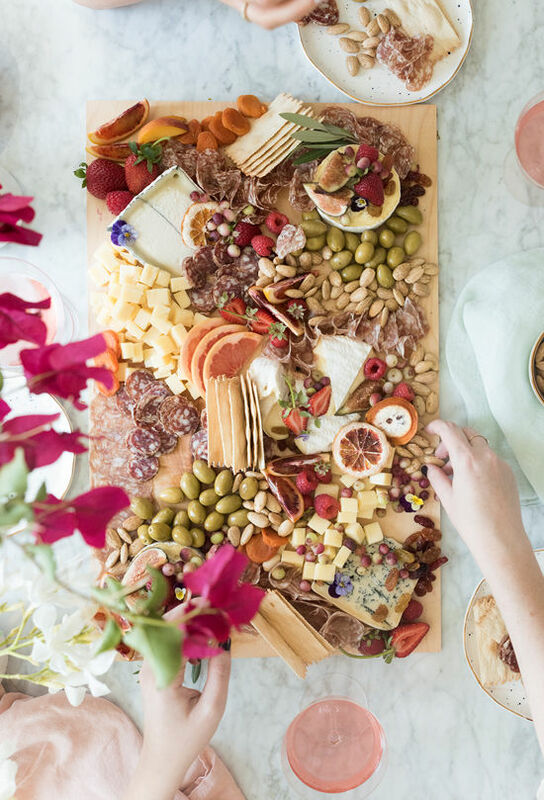 • when cutting your cheese for the board, aim for a mix of generous whole slices, slices that are cut in half so you can layer to create height and easily accessible pieces like squares of cheddar. 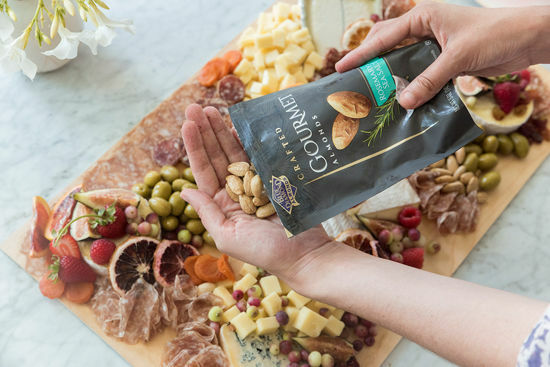 the cheddar squares are the perfect size to grab and pair with an almond and are great for grazing, no cheese cutting required! • for the charcuterie, we recommend getting it freshly sliced at your local meat shop or market. make sure they are thinly sliced! our rule of thumb is two different medium- large circular pieces and a smaller one that can be laid down or easily scattered. try to find flavors like chili, fennel and garlic. the fennel sausage was perfect with the rosemary and sea salt almonds. for the boards we used both the Crafted Gourmet Almonds Pink Himalayan Salt and the Rosemary and Sea Salt flavors. the simplicity of the pink salt variety was perfect to pair with the stronger cheese and also the sliced apples and the rosemary ones were great with the salami and the olives. they’d also be really good with some fig jam and crackers. the almonds are roasted so they have a delicate texture, that pairs well with a lot of things. 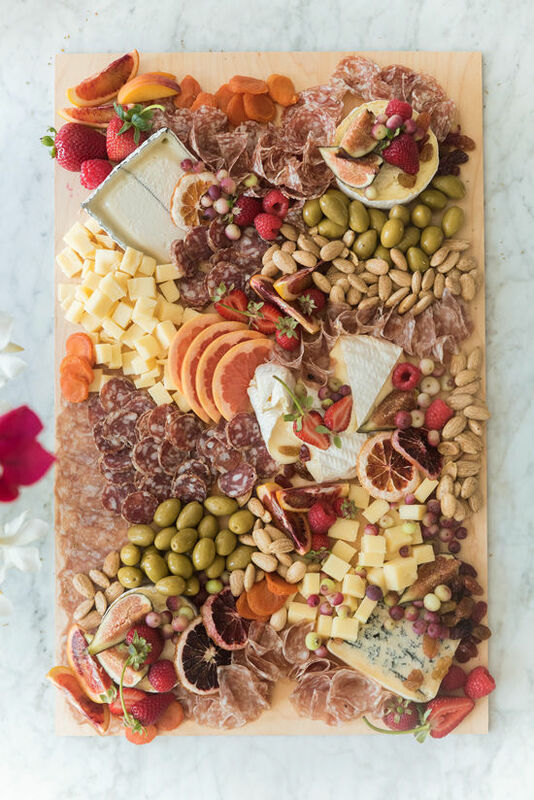 • when arranging your board, always lay the cheese and charcuterie down first. Its sets the foundation of the cheeseboard and starts the flow for the rest of the items. For texture, we make our crowd favorite “salami flowers and ribbons” that are tucked in between the alleys of the cheese. next, we cascade berries down the surface of cheese, or in any crevices for color. For holes this is where we put almonds, olives and any other items that tend to easily roll off the board. it is also a must to add something salty and crunchy, like the Crafted Gourmet Almonds. 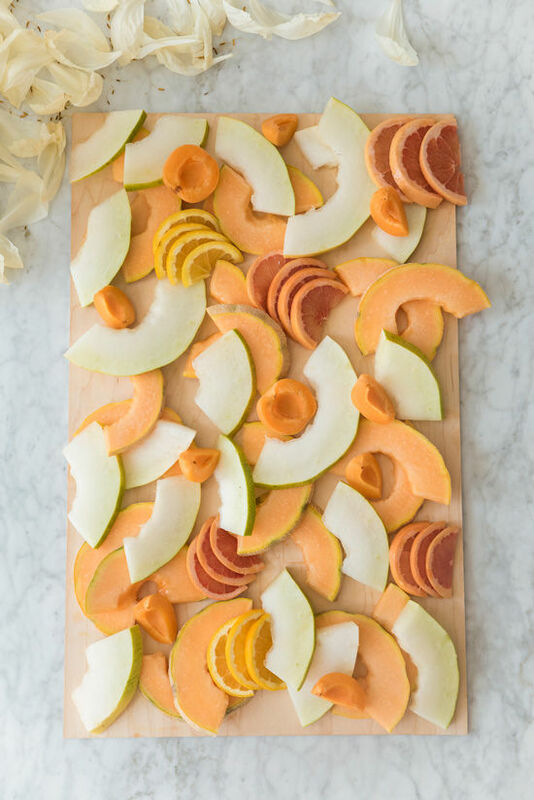 to finish off the board add the rest of the fruit and accoutrements. this is where you should be as creative as possible! 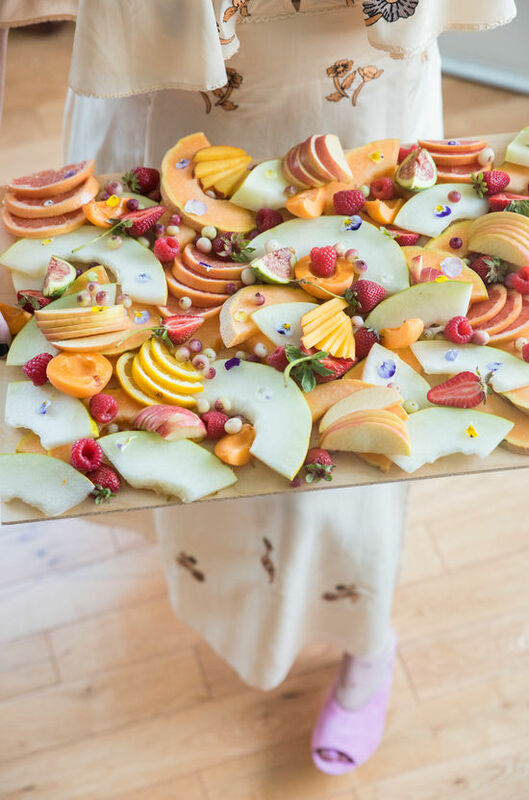 We love to cut strawberries and blackberries in half, and of course adding a pop of color with edible flowers. 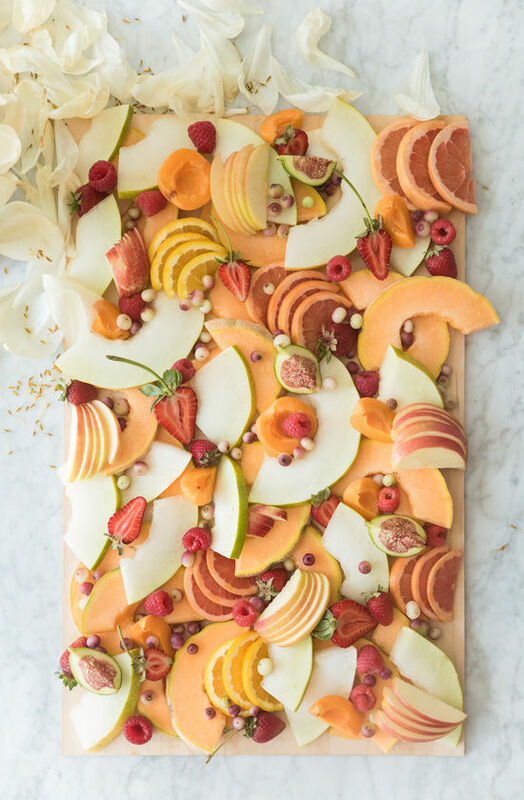 you really can make an entire meal out of these boards, put the more substantial board out first with the almonds, meats and cheeses and finish with the fruit board. we served ours with rosé but a glass of bubbly would also be great. OMG the styling of these boards is beyond! Not tortured, beautiful, inviting & strangely seems doable for a non-food stylist who’s actually just having a get together. Bravo! Where did you get these boards? Like the foundation! 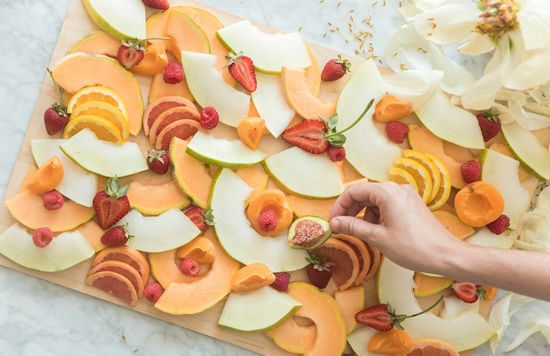 It’s like a fruit pizza :v I love to enjoy this healthy dish with my family. How to make your own vegetables are attractive and beautiful, you are the chef?